Empty Bowls - March 13, 2018. Drop in for a fun evening of friends and community. 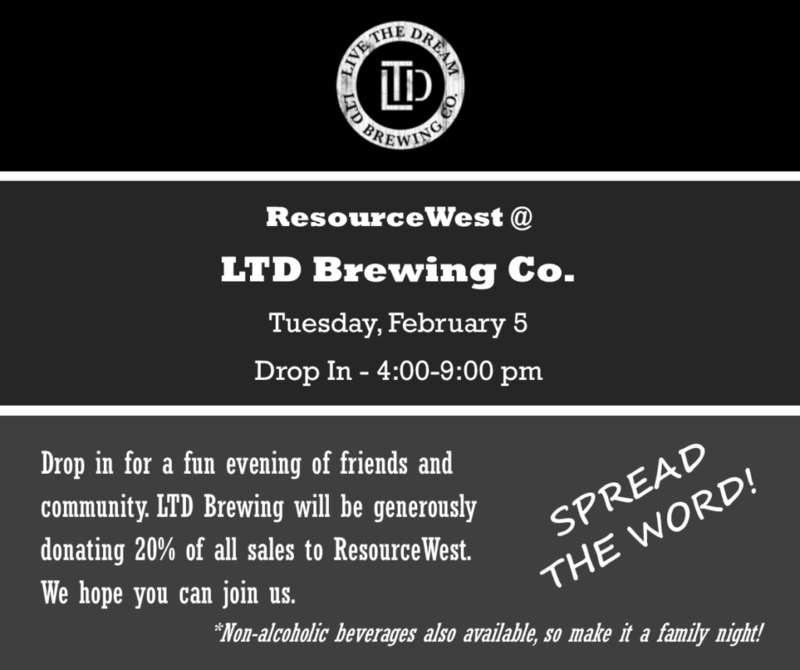 Unmapped will be generously $1 of every beer sold to ResourceWest---We hope you can join us. Spread the word! *Non-alcoholic beverage also available, so make it a family night. Toy Chest. Collection and distribution of gifts for the Holiday for parents to choose for their kids. 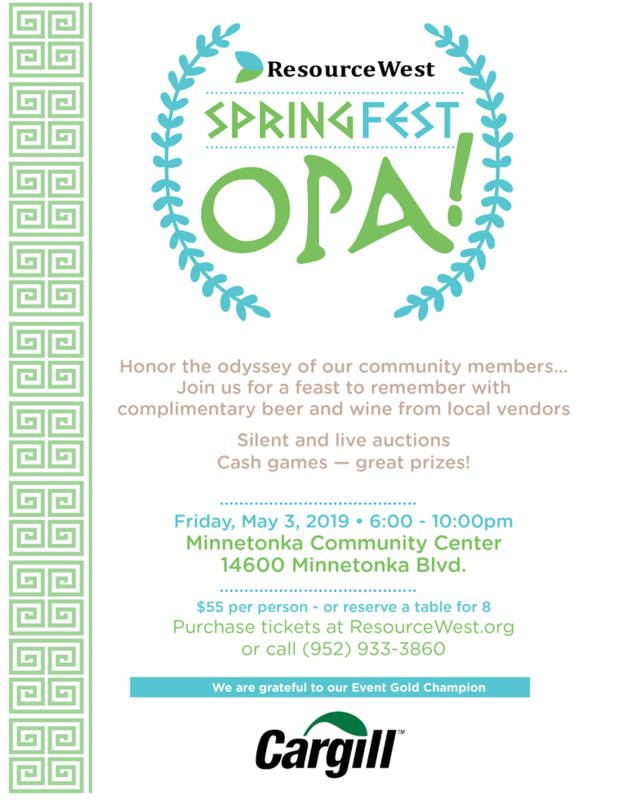 14600 Minnetonka Blvd Minnetonka, MN 55305 United States	 Boldly going where no non-profit has gone before – Join us for an out of this world experience! 1111 Mainstreet, Hopkins, MN 55343 United States	 Join us on next Tuesday, March 15th!!! 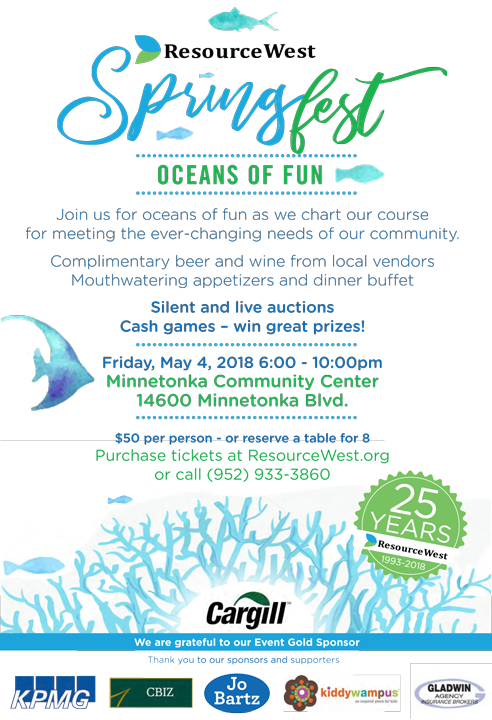 The fundraiser helps to support the programs of ResourceWest and ICAFoodshelf, and the work we do in our West Metro community. Give to the Max Day	 Every day people are falling through the cracks. ResourceWest is here to help. It only takes one unexpected tragedy – job loss, health crisis, car crash – to turn your life into a daily struggle. ResourceWest is the first call for connections to the resources our friends and neighbors need. No one should feel alone. ResourceWest’s Toy Chest registration starts Nov. 30th, and the toy donations are already coming in! We rely on our community partners and neighbors to share their resources so that all are given the opportunity to share in joy of giving. Please join ResourceWest in this years’ Toy Chest donation drive. Parents continue to struggle with ever increasing housing, energy, transportation, and food costs. In turn, family budgets are stretched thin, so parents might have less money available for gifts for the holidays. ResourceWest’s Toy Chest provides new gifts to over 1,200 children of low income families living in the Hopkins and Minnetonka School Districts or the cities of Deephaven, Excelsior, Greenwood, Hopkins, Minnetonka, Shorewood, and Woodland. Families receive one large item, one smaller items, and stocking stuffers for each child (newborn to 18 years). 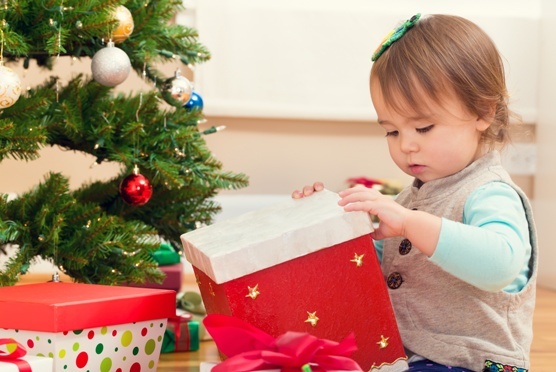 ResourceWest’s Toy Chest provides provides new gifts to over 1,200 children of low income families living in the Hopkins and Minnetonka School Districts or the cities of Deephaven, Excelsior, Greenwood, Hopkins, Minnetonka, Shorewood, and Woodland. Parents continue to struggle with ever increasing housing, energy, transportation, and food costs. In turn, family budgets are stretched thin, so parents might have less money available for gifts for the holidays. Your child(ren) must be students in the Hopkins or Minnetonka School Districts or the cities of Deephaven, Excelsior, Greenwood, Hopkins, Minnetonka, Shorewood, and Woodland. Stop by the Resourcewest booth at the Hopkins Celebration of Community during the Hopkins Raspberry Festival and meet our Interim Director, Renae Oswald-Anderson. 10:00 am - 1:00 pm	 Trash into Treasure @ Minnetonka High School	 Minnetonka High School Parking Lot 18301 Hwy 7 Minnetonka, MN 55345 United States	 Start cleaning!!! Keeping kids warm throughout the cold winter is essential in Minnesota. Too often, we see children and adults braving our tough weather with the bare minimum of winter outer wear — or none at all. ResourceWest receives frequent requests from Hopkins and Minnetonka school staff looking for winter clothing for students without the most basic cold weather items. The Winter Warm Wear Program is open from November through March each year. We stock up with new or gently used winter jackets, snow pants, boots, and new hats and mittens. This program provides winter essentials for more than 700 children of local low-income families. The program is for children from newborn to age 18. In addition, we have a limited selection of adult jackets available. Each qualified child will receive (if sizes are available) a winter jacket, a hat, and a pair of mittens. Your child(ren) must be students in the Hopkins or Minnetonka School Districts or living with these 7 cities: Hopkins, Minnetonka, Excelsior, Shorewood, Deephaven, Greenwood, or Woodland. For more information: info@resourcewest.org / (952) 933-3860. 1011 First Street So. ~ Hopkins	 Please join us as we say good-bye to Judy Elling, our Executive Director! Join us as we thank Judy for her 7 years of dedicated hard work leading ResourceWest and wish her well as she transitions into her new life in Southern Minnesota. We kick-off our Back-to-School supply drive on July 15th! We are looking to fill our collection barrels with donated new school supplies and back packs, but we also need to raise money to help support this valuable program. You can help send children to school ready to learn by watching for our collection barrels and dropping off new school supplies and back packs. Or you can donate and we’ll do the shopping for you! This year our fundraising goal for this program is $25,000. Click here to help us make an impact on the students of the Hopkins and Minnetonka School Districts. Our fiscal year end is June 30th. Your continued financial support will help families like Traci and John’s to work through their economic crisis, and find stability in their own lives, and the lives of their children. “Traci and John are two very hard working, involved parents who are doing their very best to love and provide for their two elementary aged girls, Sophia and Ellie. They both work full time jobs, but unfortunately, the family still lives paycheck-to-paycheck and is unable to build their savings. This winter John lost his job, the family was struggling financially and didn’t have any extra income to buy their children gifts for the holiday. We rely on community contributions as they represent 61% of our revenue. Your continued support allows us to continue to help the families in our community. Our neighbors. Our friends. “Eve and George came to ResourceWest for school supplies and holiday gifts for their four children. They met and started working with our social worker to get assistance paying for gas to get work. The family lives in Hopkins and both parents work full time. Eve works in Chanhassen and George works in Robbinsdale and they share one car! Things were going well and we didn’t hear from Eve and George for awhile. One day, Eve called, stressed and very worried – their one car that they rely on to get back and forth to work was broke down and needed several costly repairs! They did not know how they would afford to fix the car, they asked friends and family and no one could help them with the costs. Without a car, both of their jobs were at risk. Without their jobs, they would lose their housing – they were stressed and worried about how their family would pull though this newest crisis. Please join us in helping our neighbors like Eve and George by making a contribution at any level to ResourceWest today! Again, thank you for your past support and your continued support as we enter continue into our next 20 years of serving the needs of the people in our community. P.S. After more than 20 years of ResourceWest helping children and families, I can tell you that there is never a failure of opportunity to effect change – we are simply too often paralyzed by our unwillingness to effect change – we are simply too often paralyzed by our unwillingness to even try. Please show your support for neighbor by making a donation today. You are invited to join us at our 16th annual Empty Bowls Event to choose your favorite handmade soup bowl, eat a simple meal of donated soup and bread, enjoy a variety of musical entertainment, and make a generous free will donation. Professional potters have donated beautiful bowls and related art for our silent auction. Since its small beginnings in 1990 at Lahser High School in Bloomfield Hills, Michigan, Empty Bowls has become an international grassroots project to raise funds for local food shelves. In 1999, Hopkins Public Schools art teachers and leaders in Hopkins Community Education saw the growing need for a fundraiser for hunger in our own community. Art students and community potters have been creating hundreds of unique soup bowls for the event ever since. Over the first 14 years of Empty Bowls, our Hopkins Schools community has raised a total of $695,275 to assist our neighbors through the work of ResourceWest and ICA Food Shelf! Are there hungry people in our community? ICA Food Shelf, located in Minnetonka and Excelsior, provided 11,945 food assists in 2012, an increase of 112% since 2008, and distributed $301,735 last year to assist families with rent, mortgage and utilities. ResourceWest, located on Mainstreet Hopkins, connected over 10,000 area residents to the resources they needed in 2012, including emergency financial support to over 600 families, over 1,100 Second Harvest commodity food packages, and more than 130 emergency food bags on behalf of ICA Food Shelf. Be a sponsor in the SUPERVALU Challenge! 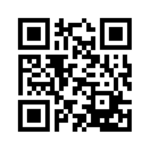 You decide your sponsorship level, send it in by March 1st, and be recognized on all print materials at the event. Sponsors of $250+ will have their logos prominently displayed. Make a ceramic or felt bowl in a Hopkins Community Education class in February. Be an in-kind sponsor of soup, bread, coffee, and other needed materials. Artists can donate a fine art bowl or hunger related art for the silent auction. Musicians can donate their time and talent by entertaining at the event. Schools can include hunger issues in the curriculum, bowl making in art classes, promotional poster design in art and tech classes; students and staff can help serve soup or perform at the event. • Minnesota FoodShare’s 1999 Most Creative Drive Award Together we can make our community a healthy place for all to live.